Are you an author in Sweden with a book manuscript you want to get in front of a publisher without the need for a literary agent? 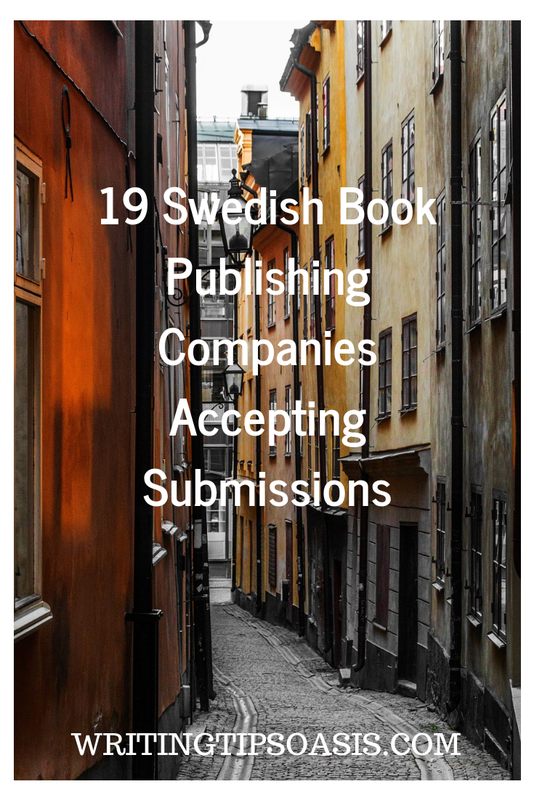 Take a look at the following 19 Swedish book publishing companies accepting submissions. Are you looking to work with a publishing house that has collaborated with Nobel Prize winners? If your answer is yes, Norstedts Publishing House is exactly where you need to go! Established in 1823, this Stockholm based company rolls out hundreds of fiction and non-fiction titles every year. They also have a line of children’s books under the subsidiary company Raben & Sjrogen. Over the last several decades, Norstedts, have worked with leading names in the publishing industry and their clientele includes award-winning authors like Jonas Gardel, Carl Hamilton and Anna Jansson. Although they primarily focus on Swedish books, a couple of their titles are also translated from German, Finnish and English. As of now, Norstedts is accepting unsolicited submissions and you can always browse through their submission guidelines and contact form here. Often touted to be the best among ‘Top threes of Sweden’, Albert Bonniers is one of the biggest publishing houses on this list. Based in Stockholm, this company was initially founded by Albert Bonniers in 1837. Over these last few decades, Albert Bonniers Forlag has managed to strike contracts with leading authors in Sweden as well as many other Scandinavian countries. They’ve published books in Finnish, Nordic, German, Russian, English and even French. Like Norstedts, Albert Bonniers too has worked with Nobel Prize winning authors and you can always count on them for dependability and widespread distribution. The company approximately produces more than 100 titles every year. So if you’re looking to join their list of best-selling authors like Marie Bengts and Annette Halland, here’s what you need to know about their publishing guidelines. A perfect platform for children’s fiction authors- Opal is an independent publishing company based in Bromma, Sweden. It was formed in 1973 with the sole intent of giving an opportunity to newbie authors. Over the time, they gained massive momentum, and right now, Opal stands as one of the biggest children’s publishing houses of Sweden. Although they’re based in Sweden, the company has worked with several foreign authors from Germany, Finland, Russia and Norway. One their best-selling writers Sven Nordqvist, even managed to come up with an independent series of nine different books that were later published in 45 different languages. As of now, Opal only publishes 45 titles every year and although the submissions were closed for a while, they are now accepting manuscripts from September, 2018. So if you’re an excellent writer who’s looking to deliver their work to the perfect audience base- reach out to Opal on this page. If you’re fond of churning out powerful pieces on human rights and the demagoguery of political/social activists- Ordfront & Galago is your ideal destination. Established in 1969 in the brink of Vietnam War, the publishing house has been consistently driven to print and disseminate information that the general public is still oblivious of. Almost five decades down the line, they are still undeterred in their goal of giving a voice to the people who ‘actually’ need to be heard. Therefore it is only evident that you’ll find some of the best works in cultural history and fiction in their collection. Owing to their liberal mindset, they’ve managed to strike great relationships with supremely talented authors like Elizabeth Abiri, Lena Ackebo and Karin Ahlborg. Like many other publishers featured on our list, Orfront too comes up with several quality titles every year. Although they primarily focus on Swedish and Norweigan, you can also send in your manuscripts in Finnish, German and English. Ordfront is currently up for submissions, and you can always send a copy of your manuscript here. A subsidiary of HarperCollins, HarperCollins Nordic is a Stockholm based publishing house that works with both established names as well as newcomers in the Swedish publishing industry. The company was founded in 1817, and over the last few decades, it has received several awards for its creative, insightful and gripping titles. Although it covers quite a few genres, HarperCollins is particularly fond of children’s books, fiction titles, cookbooks, coffee-table books and the likes of it. Their Swedish branch is currently accepting unsolicited manuscripts and you can always send in a copy of your text, as long as it is written in Swedish, Nordic, Finnish or Danish. For more details about their submission guidelines; visit this page. As evident from their name, Natur & Kultur is a publishing house that is entirely focused on publishing titles related to nature, culture and everything else encompassing these genres. The company was established by publisher Johan Hanson 1947, and over the last seven decades, they’ve only strengthened their reputation as one of the best publishing companies in the country. Natur & Kultur has worked with award-winning authors and have published several titles pertaining to cookbooks, gardening, natural history, academics and the likes of it. They currently have an open submission policy and you can always contact them on this page. Bokforlaget Forum came to inception in the early months of 1940, when publisher Adam Helms wanted to establish a new platform for newcomers in the publishing industry. His goals worked out, and over the years, Forum has managed to collaborate with the leading Swedish authors in town. The company publishes everything from general fiction to coffee table books; crime fiction to biographies and documentaries. Although they prefer working with Swedish authors, you can also send in texts in German, Nordic and English. In case you’re looking to collaborate with them, here’s a link to their manuscript submission form. A subsidiary of Norstedts Publishing Company, B. Wahlstorms Publishing house was established in 1911 to publish children’s fiction titles. Over the time, they’ve come up with excellent books that have inspired kids of every possible age. Wahlstorms has been widely lauded by authors and critics for their mind boggling children’s tales, and although they prefer working with Swedish writers, they do publish quite a few translated works every year. Among languages, they’ve worked with Finnish, Nordic, German and English till date. So if you have a gripping children’s title to share- contact them on this page. A sister company of Norstedts publishing house, the history of Raben & Srojen dates back to almost twenty decades. The company is headquartered in Stockholm, and they primarily cover children’s fiction and non-fiction titles. While Raben and Srojen, accepts every kind of children’s title, they are particularly fond of works with a creative hint and a gripping storyline. As of now, they cover Nordic, Finnish, German and Russian languages. Raben and Srojen, has worked with leading authors like Astrid Lindgren and Elias Vahlund and you can always count on them for consistent distribution. The company is currently open for submissions, so if you have some of your best titles to share, contact them on this page. Based in Stockholm, Sweden, Alfabeta BokForlag is a relatively new publishing company that focuses on fiction, children’s titles, historical non-fiction and pocket books. The publishing house was established by David Henried, who was driven by the goal to come up with quality books that strikes a responsive chord among young readers. Over the last couple of years, he has relentlessly worked with a close-knit team of team of editors and authors; and going by his latest sales, he definitely seems to have achieved his goal. As of now, the company has collaborated with talented authors like Katarina Mazzetti, Erlend Loe and Nanna Johannson who have come up with quite a few award-winning titles. Alfabeta accepts works in Swedish as well as foreign languages like Russian, English, German and Finnish. Unlike many other Swedish publishing platforms, they also welcome new authors and translators who are looking to establish a solid presence in the industry. Luckily enough, Alfabeta is currently up for submissions. So if you have your best works to share, contact them here. Based in Stockholm, Brombergs Publishing house was established by father daughter duo Adam and Dorotea Bromberg. Their company comes with a rich history of more than 37 years, and during this time, they’ve managed to cover every relevant genre and sub-genre in general fiction, historical fiction, biography, children’s books and general non-fiction. They represent many authors across the globe, and you’d find several Nordic, Finnish, German and French titles in their catalogue. While Brombergs was initially closed for submissions during the summer, they are looking to initiate the process during fall. Check out this submissions page for the most recent updates about their submission guidelines. A leading publisher in the Nordic region, Edmont Publishing is one of the oldest connoisseurs of fiction and children’s titles in the region. The company publishes more than 700 magazine titles and almost 2100 books every year. As of now, they work with Nordic, Swedish, Finnish and German authors. So if you have some good works to share, contact them with your manuscript on this page. If you’re looking to collaborate with a publishing agency that focuses on high quality content for kids and young-adults- Bergh’s Forlag can be your best bet. Established almost a decade back by talented publishers Lena Andersson, this company is entirely dedicated to connect with young readers with their fiction and non-fiction titles. And guess what? Within just ten short years, they’ve managed to cover everything from children’s novels, fantasy tales, picture books, and also your regular text books. In addition to their children’s titles, you’ll also find a couple of hobby books for adults. As of now, the company only works on Nordic titles. Although they do publish translated copies, they are very few in number. So in case you’re looking to connect with them- drop in your manuscript here. Atrium Forlag is an independent; Umea based publishing company that is entirely focused on publishing cultural history titles and everything else in the fields of film and theatre. Over the last twelve years, they have rolled out several high quality titles in Scandinavian and European languages like German, Finnish, Nordic, French and even English. Although they’ve published only 80 titles till date, most of their work has been lauded for its quality and attention to detail. Luckily enough, Atrium Forlag is currently accepting manuscripts. So you can always send in a copy of your manuscript here. Like Alfabeta, Dark Daughter too is a relatively new publishing company that is driven to tap in the young audience base. An imprint of the famous Mörkersdottir publishing house, Dark Daughter was established in 2014 and since then, they’ve been solely driven to publish fantasy, romance, dark humor and paranormal titles. Being a small company, they’re currently focusing on Swedish books alone. However, you can always contact them for a better idea about their foreign author policy. Darkdaughter has an open-submissions policy and you can always reach out to them on this page. Ruin is a Swedish publishing company that was established in 1966 by Herald Hultqvist, Nils Hakanson and a close-knit group of publishers and editors. As of now Nils manages the company, and under his able leadership, Ruin Publishing Group has rolled out several original as well as translated titles in general fiction, historical fiction, biography, anthology and the likes of it. They primarily work with Finnish, Danish, Nordic and Swedish languages. While the company doesn’t encourage you to directly send in an unsolicited manuscript, you can always share your book ideas with them. In case your idea makes the cut, they will collaborate with you for their upcoming projects. You can contact them here. Founded in the year 2000, Salomonsson Agency is an independent publishing house based in Sweden. The company came to inception with the goal of representing Nordic authors and screenwriters, and almost eighteen years down the line, they are still going strong! The small publishing house that was first founded by an avid book-lover now employs more than 22 supremely talented editors and writing professionals. As of now, the Salomonsson has managed to work with critically and commercially acclaimed authors who’ve been widely lauded by Nordic readers. Their content is well-appreciated for their form, style and creative appeal. Salmonsson is currently open for submissions. However, you can only send in Nordic scripts. In case you’re interested, visit this page for more guidelines. Unlike any other publishing company featured on our list, Skreid Publishing is an independent publishing house that specializes in art-photography books. The company was established by Swedish publishers, Johan Willer and August Eriksson around two years back to represent and disseminate the otherwise underrated Nordic artists. Their efforts turned out to be fruitful and right now Skreid has managed to collaborate with several international publishing houses for better and wider distribution. The company is currently looking for new artists as well as book proposals. So if you’re looking to share your non-fiction, photography-based manuscript, contact them on this page. Volante is a small publishing house based in Old Tow, Stockholm. While the company was established a couple of years back for publishing fiction titles, it soon picked popularity, and within just one decade, they’ve managed to work with leading Finnish, Brazilian, Nordic, English and German authors. Although they are primarily interested about Swedish texts (written in any Scandinavian language) you can also send in translated copies of other works. So in case you’re looking to work with them, check their mailing address on this page. Do you know any other Swedish book publishing companies? Please tell us about them in the comments box below! I am Ruposhree, a regular happy-go-lucky girl with not-so-regular (read extraordinary) dreams. I love reading, obsessing over random TV series, dreaming of unrealistic vacations, and most importantly, trying my hand at writing. I want to believe that I somehow have a way with words and maybe one day I’ll manage to see and be everything that I ever dreamt of!